Final update on this - I had forgotten this topic. The MAF that I had replaced was obviously not the correct MAF. I purchased one from Pelican Parts and all issues were solved and all HP was there. 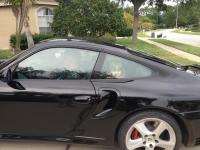 You know I sold this car; my little girl got bigger and I'm now in a Panamera Turbo - but boy do I miss the 996tt. Was a monster car. One day when my little one is too big I hope to return to the 911 platform. Not rushing that though -- my daughter is already growing up too quickly... I hope this helps someone! Yep I used super bright LEDs site to replace all but the vanity mirror and the reversing lights. I actually tried to do the reversing lights but I think mine are sealed differently than expected. Thank you for the follow up on the window switch. You shouldn't have to push like that. Glad it's getting fixed. Did you ever come to a resolution on these fault codes? So I purchased my vehicle from the dealership without custom ordering and until my wife recently obtained a new Macan Turbo with leather I had forgotten what I was missing :) Any part numbers for leather dash (black), door panels (black), etc? Thank you for any and all help! Any ideas if this can be a retrofit adding better nighttime lighting to the vehicle? The non-light design is okay, but not optimal. Maybe part numbers for light design package parts. Center overhead console, outside mirrors, etc? Purchases a Macan Turbo with my wife! It's her DD - and she loves it! Did you end up just pulling it out or are their screws? Just hit 2k and will be changing the fluids and getting some blackstone analysis done. As for the noise above4k - worth the wait - AMAZING!